Crowdfunding: Where people trust random strangers with their money, and smile doing it. It is hard to not have noticed the immense increase in popularity for crowdfunding. The concept of allowing you, as a customer, to directly influence the creation of a product you always wanted or a company you really like, is very appealing. It gives consumers power. And if anything, people are always interested in power. However, as with every exciting new development there is also a dark side to crowdfunding. Over the few years that crowdfunding has existed, there have been a couple of instances where successful crowdfunding campaigns turned out te be a fraud. A famous example is the Kobe Red campaign on Kickstarter, which promised their funders the world’s first beef jerkey from Kobe Red meat. In the end it turned out the company didn’t even exist. However, apparently enough people were convinced that the campaign was legit, as they managed to raise $120.000. A moderate funding goal sends the signal that the entrepreneur is cautious and realistic. This is therefore a good sign of legitimacy for funders. Also, when a campaign has already accumulated some funding, this is a big sign of legitimacy towards other funders, who are much more likely to invest then. 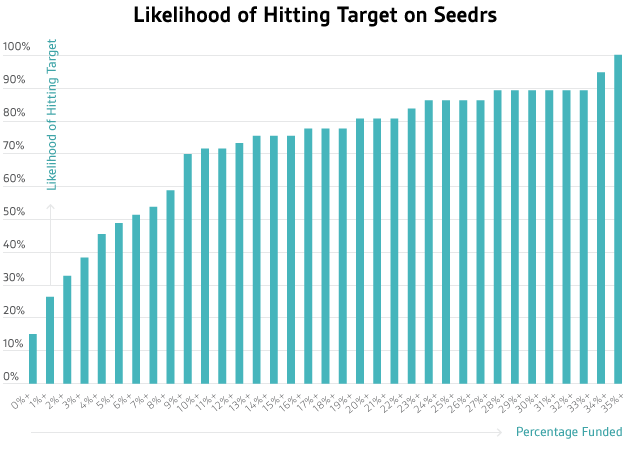 A report from Seedr, one of the larger equity crowdfunding platforms, mentions that once a campaign hits 30% of its funding goal, the chance to reach the entire goal jumps to 90%. An interesting aspect of reward-campaigns are the perks they offer their funders. The perk is often the main motivator for funders to donate. As such, the type of perks might also influence the campaign legitimacy. Frydrych et al. did not find conclusive results for this, however I feel there should be a more in depth look for this topic. For instance, some campaigns offer a perk to meet the team. This might signal legitimacy, as it proves that the team exists. Also, many campaigns offer a pre-order of their product as a perk. Legitimacy might be less important for these type of perks since people simply want the product. Campaigns that focus more on the company, such as musicians raising money for their album, might need more legitimacy for funders to donate. Finally, it appears that a team of entrepreneurs is considered more legitimate than just a single entrepreneur. This makes sense, as there is usually more expertise present in a team which increases the chances of success for the company. Investors are more likely to invest in companies with high success chance. Overall the article gives some interesting perspectives, however it did not include all the possible aspects that could affect legitimacy. Mollick (2014) mentions quality signals such as spelling errors, preparedness of the entrepreneurs and social presence of the team, these could all affect legitimacy as well. It would be interesting to see if legitimacy could be used as an overall explanation of funding behavior. ZEEF: Taking on Google by using… humans. Recently a new Dutch start-up has been getting some media attention. They have given themselves the name Zeef (the Dutch word for a sieve), a name that will start to make sense if you continue on reading. Zeef has taken on a rather ambitious goal; challenging Google by changing the way people search for information online. Their trick essentially revolves around sieving the information on the web to only show the relevant bits to people searching for a specific keyword. The interesting thing about Zeef is that this sieving is done by humans. On Zeef, the information you can search through is managed by so-called curators. As a curator, you can create a page about a topic you like, let’s say backpacking. All the content on this page about backpacking is managed exclusively by you, the curator of the page. Curators can then add links to other websites with relevant information on backpacking on this page, and categorize these links into blocks on the Zeef page. So you might find a block with all kind of links about things to take on your backpacking trip and another block will show you all kinds of websites you can use to find hostels. It is also possible to add images or just blocks of text to your Zeef page, but the main aspect is the collection of links to websites relevant to the topic. The idea behind this is that humans are far better capable of deciding whether a website is relevant to this topic than algorithms, such as Google’s, ever will be. Now you might think “How do I know if this random person who created the page on backpacking is actually knowledgeable on the topic?”, and this would be a fair question since anyone can become a curator and setup a page within minutes. 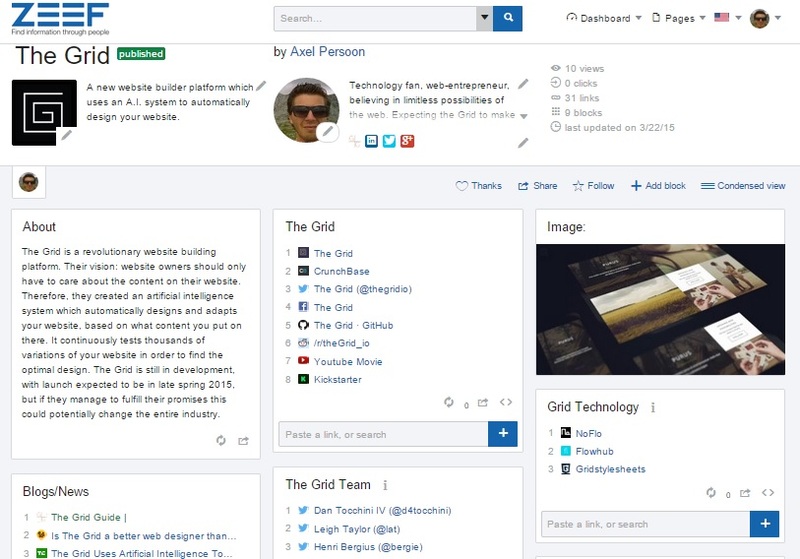 Zeef has tackled this problem by allowing other curators to ‘challenge’ a already existing page on the topic by creating their own page on the same topic. So let’s say you come across the backpacking page on Zeef and think you can do better. You can then simply create a page on the topic on backpacking as well, and when someone then searches on backpacking he/she will be able to choose between the two versions. If you like a page you can vote for it, and this way a ranking of multiple posts on the same topic is created. Zeef has a really interesting approach, as it basically argues that a recommendation system by humans is better than a recommendation system based on a algorithm. And there might be some truth in that statement. As mentioned in the paper by Tsekouras & Li, people appreciate the effort made by recommendation agents. I can imagine that this appreciation of effort is even larger if people know the recommendation agents are human. The strength of Zeef lies in its numbers, and perhaps over time we will see a extensive hub of information completely curated by humans instead of algorithms.